We’d love your help. Let us know what’s wrong with this preview of Sand Creek Serenade by Jennifer Uhlarik. To ask other readers questions about Sand Creek Serenade, please sign up. There is so much to love about this story! The strong female lead, rich historical details, Native American culture, faith in God, mystery, and a tender romance. You won't want to miss this delightful, page-turning adventure on the wild frontier! Sadie Hoppner has studied and worked hard to learn all she can about medicine. She spent long hours reading her father's medical journals, watching and assisting him with patients. Now working alongside her brother for the Army, she is beginning to see h There is so much to love about this story! The strong female lead, rich historical details, Native American culture, faith in God, mystery, and a tender romance. You won't want to miss this delightful, page-turning adventure on the wild frontier! Sadie Hoppner has studied and worked hard to learn all she can about medicine. She spent long hours reading her father's medical journals, watching and assisting him with patients. Now working alongside her brother for the Army, she is beginning to see her dream of healing and helping come true. I truly didn't want the story to end. I highly recommend this excellent story to one and all, especially those who enjoy a story set in the Western frontier! I look forward to reading more from Jennifer Uhlarik in the future! Sand Creek Serenade is a historical romance fiction book that tells a story of a woman in a field that normally belongs to men during this time in history. She was a doctor, and a spunky, outspoken one at that! She was brilliant, brave and was not afraid to do what she felt God was leading her to do. She was not going to backdown no matter what any man told her. I loved Sadie Hoppner and was rooting for her the whole time! I also really enjoyed the story line between her and Five Kills. It is a Sand Creek Serenade is a historical romance fiction book that tells a story of a woman in a field that normally belongs to men during this time in history. She was a doctor, and a spunky, outspoken one at that! She was brilliant, brave and was not afraid to do what she felt God was leading her to do. She was not going to backdown no matter what any man told her. I love stories about women in history who bucked tradition and made their path in life outside of what society expected. In this case, Sadie Hoppner practices medicine alongside her brother Ben at Fort Lyon in the Colorado Territory circa 1864. Treating illnesses and mending wounded men has it's own degree of satisfaction for her. Convincing the soldiers of her skill and experience will take a bit more time. Things get even trickier when she encounters a Cheyenne brave named Five Kills and then I love stories about women in history who bucked tradition and made their path in life outside of what society expected. In this case, Sadie Hoppner practices medicine alongside her brother Ben at Fort Lyon in the Colorado Territory circa 1864. Treating illnesses and mending wounded men has it's own degree of satisfaction for her. Convincing the soldiers of her skill and experience will take a bit more time. Things get even trickier when she encounters a Cheyenne brave named Five Kills and then later treats his injuries after he was attacked by the same soldiers. With tensions already at an all-time high and peace negotiations between both Indians and the Army, these two walk a fine line when they feel an instantaneous draw to one another. How can their opposite polar worlds come together for the good of their people and their hearts? I have to say I was super impressed with this work of fiction! I found it well-written, engaging and drew me in right away. Not to mention my emotions were running on high throughout the whole thing. My heart definitely ached for both Sadie and Five Kills as they try to navigate the rough waters of what life has thrown them into. My heart also hurt for so many Indians who were senselessly slaughtered, many of them defenseless women and children. There were places in the book where I tears in my eyes as I read the account of the Sand Creek massacre. So many innocent lives lost just because they were viewed as an inferior people, it definitely tugged at my heart! Jennifer Urlarik did her research and it shows through, so many vivid historical details made for a richly satisfying story that sticks with you long after you finish. All with an underlying love story to smooth the rough edges and made me root for Sadie and Five Kills to find a way to be together. I can't honestly say enough good about this book! There was so much to it for me and ticked so many boxes of what makes a great story. I really hope the author has more coming, they would be my automatic must-read-now. Be sure to read the author's note at the end where she gives more detail about this story, some of the characters in history she portrayed and shares her research. I found it fascinating and made the book come more alive for me! It is exciting for a historical romance reader to find a novel that takes place in an area they know well. Such is the case for me with Sand Creek Serenade. This story centers around the historic and horrific Sand Creek massacre, which occurred on the southeastern plains of Colorado in 1864. Much of the story takes place at Fort Lyon, where I worked for many years when the facility served as a VA Hospital. 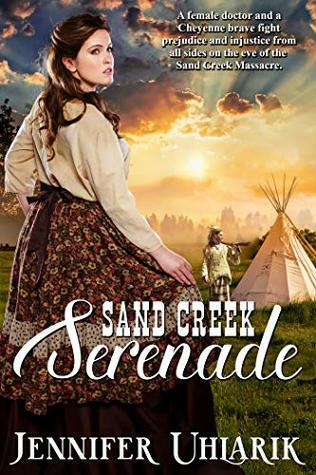 Sand Creek Serenade is a well-researched novel that bridges the chasm between whites and Na It is exciting for a historical romance reader to find a novel that takes place in an area they know well. Such is the case for me with Sand Creek Serenade. This story centers around the historic and horrific Sand Creek massacre, which occurred on the southeastern plains of Colorado in 1864. Much of the story takes place at Fort Lyon, where I worked for many years when the facility served as a VA Hospital. Sand Creek Serenade is a well-researched novel that bridges the chasm between whites and Native Americans during a time in history when hostilities ran rampant between the two cultures. Author Jennifer Uhlarik presents a well-crafted story enriched by historical fact. and actual historical characters who played a major part in the tragic events leading up to and during the brutal and bitter attack. The author, in addition to capturing authenticity with her research, has brought to life the daily existence of both soldiers and Indians with believable fictitious characters. Five Kills, a Cheyenne brave, is caught between the white world he used to know as a young child and the customs he adapts when circumstances require him to seek a home with his mother’s tribe. Sadie Hoppner possesses the perseverance to pursue a male-dominated career as a physician, throwing caution aside in pursuit of her passion to care for her patients. When these two come together, their worlds collide, but their hearts form an unbreakable bond. I loved the western action and the depiction of the Colorado plains where I have made my home for many years now. The portrait Jennifer Uhlarik paints of the people who lived here and the struggles they faced over a century ago is delightfully accentuated by a supposedly impossible romance that only God’s hand can see fulfilled. The story is told from a Christian worldview without preachiness, but with a sincere growth and strengthening of faith as the characters experience doubts, fears, and experience healing. Dr. Sadie Hoppner and her brother Dr. Ben Hoppner live at the fort where her brother is stationed. She joined her brother after the death of their father. She is working hard to find acceptance as a doctor by the men at the force. Outside the fort Cheyennes and Arapahos are camped as the work on a peace agreement with the Army. When Five Kills, a Cheyenne brave, meets Sadie by chance their worlds collide and the peace treaty is in danger. I wasn’t sure if I would like this book, but I was quickl Dr. Sadie Hoppner and her brother Dr. Ben Hoppner live at the fort where her brother is stationed. She joined her brother after the death of their father. She is working hard to find acceptance as a doctor by the men at the force. I wasn’t sure if I would like this book, but I was quickly hooked. While it is based on a real event in our country’s history, the romance adds a different dimension. The characters are well-developed and interesting. The plot moves at a steady pace. The romance drives the action in this story, but the massacre caused me to stop reading for a day. Knowing that is was one of several attacks on innocent people with no purpose is difficult to read. I recommend this book to those who like historical fiction. I received a complimentary copy from the author and was under no obligation to leave a review. All opinions are my own. I found myself drawn into the story, praying, crying, and laughing while reading the many events that took place. When I finished, I wanted more. I am now a permanent follower of Author Jennifer Uhlarik after finishing her first full length story A Sand Creek Serenade! She is an amazing storyteller and has a way of writing that puts you right in the story as if you are experiencing all the emotions and adventures along with the characters in the story. I could not put the book down! It was interesting to imagine what fort life might have been like on the frontier. I love Sadie, the strong female lead in the story who is a rare female docto I am now a permanent follower of Author Jennifer Uhlarik after finishing her first full length story A Sand Creek Serenade! She is an amazing storyteller and has a way of writing that puts you right in the story as if you are experiencing all the emotions and adventures along with the characters in the story. I could not put the book down! It was interesting to imagine what fort life might have been like on the frontier. I love Sadie, the strong female lead in the story who is a rare female doctor for the time, working alongside her brother Ben, the official army doctor. She tries to follow God's promptings in her life and what an adventure she has. I love the story line with Michael Five Kills the half white, half Cheyenne male lead in the story. The conflicts between the white man and the native american peoples is a truly sad part of our american history. Author Uhlarik handles it deftly, she has actual people from the Sand Creek Massacre appear in this story and it is apparent that she has done her research well. If you like historical fiction, you will love Sand Creek Serenade. I highly recommend it. I loved this book! The author did a great job writing this! She took a very difficult topic and wrote it with grace. It was great reading about a woman that went against the norm for her time. I loved the characters, especially Five Kills. This is a book that I would like to read again! I was given a complimentary copy of this ebook from the author, but was not required to write a review. The thoughts and comments are my own. I find stories set in the midst of actual historical events particularly interesting. Sand Creek Serenade takes place in 1864 during the time of the Sand Creek massacre. Tensions between settlers and Native Americans had increased and these two cultures fought for control of the Great Plains of eastern Colorado. Sand Creek Serenade is full of independent, and strong-willed, multidimensional characters. As one might expect, it’s fairly raw in parts, but it is also a story of friendship, faith, an I find stories set in the midst of actual historical events particularly interesting. Sand Creek Serenade takes place in 1864 during the time of the Sand Creek massacre. Tensions between settlers and Native Americans had increased and these two cultures fought for control of the Great Plains of eastern Colorado. This was a book that I could not put down until I reached the end! The author did an excellent job of addressing such thought-provoking themes – from the realities of forging ahead through obstacles as a female physician in the 1800s to the tenuous relationship between the Army and the Native Americans to the frowned-upon friendship between the main protagonists. The characters were well written and elicited a range of emotions. I was impressed by the author’s ability to describe complex and con This was a book that I could not put down until I reached the end! The author did an excellent job of addressing such thought-provoking themes – from the realities of forging ahead through obstacles as a female physician in the 1800s to the tenuous relationship between the Army and the Native Americans to the frowned-upon friendship between the main protagonists. The characters were well written and elicited a range of emotions. I was impressed by the author’s ability to describe complex and conflicted people. Above all, I found myself cheering for the sympathetic characters, Sadie and Five Kills, through all of the hardships they faced. The element of trusting God, even in the face of such heartbreak, was genuinely woven throughout. This was a wonderful work of historic fiction, and I look forward to reading more from this author! I thoroughly enjoyed Sand Creek Serenade. It was a beautiful story, rich with historical detail. I love women who bravely do the work they love and are called to do, even when it goes against social norms. Sadie Hoppner does just that when she becomes a doctor and works alongside her brother in a military fort. I thought Uhlarik did a fabulous job writing about the Native Americans and their plight amid the prejudice of the time. Beautifully done. Dr. Sadie Hoppner has fought to be taken seriously since childhood, when her father began training her in the healing arts. It is difficult to find acceptance and respect but especially so at Fort Lyon, where she’s come to practice medicine under her brother’s watchful eye. Then Five Kills, who wouldn’t knowingly jeopardize the peace treaty recently negotiated between his people and the Army, has a chance meeting with the female doctor that ignites memories of his upbringing among the whites. So Dr. Sadie Hoppner has fought to be taken seriously since childhood, when her father began training her in the healing arts. It is difficult to find acceptance and respect but especially so at Fort Lyon, where she’s come to practice medicine under her brother’s watchful eye. Then Five Kills, who wouldn’t knowingly jeopardize the peace treaty recently negotiated between his people and the Army, has a chance meeting with the female doctor that ignites memories of his upbringing among the whites. So intrigued that he can’t stay away, tension erupts with the soldiers, and Five Kills is injured. A bond is formed with the pretty healer as he recuperates under her tender care. Their fledgling love is put to the test when each realizes that a much greater danger awaits them that they are unable to stop and may not survive. I love how the author shows the anger, hatred, and mistreatment of the Indians and half-breeds. The research of facts included at the end makes the story more reality than fiction. I didn't want to stop reading - and I still don't, but I had to stop because I finished the book! This is one of the very few times that I have tried to slow down while reading so that I wouldn't finish the book so soon, however I couldn't help but continue to read it until the end as quick as I could to see what would happen! I wanted to read more! I wanted to learn more about the Massacre. I wanted to fight with the tribes and stand up for them! I wanted to remove any obstacles preventing the I didn't want to stop reading - and I still don't, but I had to stop because I finished the book! This is one of the very few times that I have tried to slow down while reading so that I wouldn't finish the book so soon, however I couldn't help but continue to read it until the end as quick as I could to see what would happen! I wanted to read more! I wanted to learn more about the Massacre. I wanted to fight with the tribes and stand up for them! I wanted to remove any obstacles preventing the heroine and the hero from being together. Jennifer has a way of making her characters, Dr. Hoppner and Five Kills come to life! You learn to root for them in good times and in bad. And I am personally, rooting for a sequel!! Even a trilogy! Jennifer Uhlarik's Sand Creek Serenade is a prime example of an author who must really love research! I loved the idea of a lady doctor at a military base. The fighting scenes were gory, but unfortunately very accurate. The hero, a half-white, half Native American man was my favorite part of the book. So dreamy! I just loved this interesting story, it has a little of history,war,romance and a great example of how women have had to fight for our rights and free will. Thankyou! Jennifer Uhlarick is a new author for me. I enjoyed her storytelling, characters, and the pacing of this novel.